Heya people. It’s been a while again, but I promiss that I keep updating as soon as I have something new. 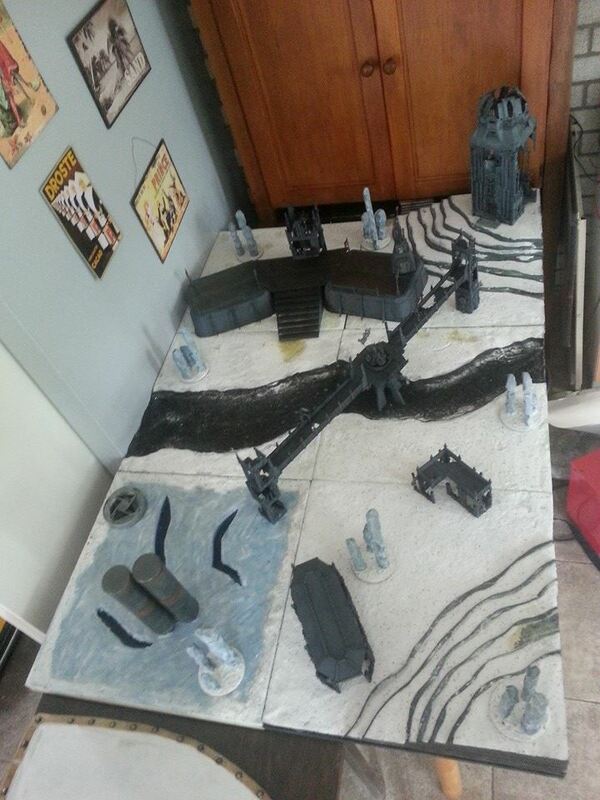 So recently, I finished a new home made gaming board. This time in a snow-world/habitat theme. The terrain that I painted or it are painted in a dark grey colour to really give it a nice contrast, and the way I painted it makes it looks somewhat weathered. Some terrain pieces are painted in a dark, gunmetal colour with a frosted effect on them, and painted some rust effects on some of them as well. The Ice spires are painted using a lightgrey basecoat then ”washing” them with a very watered down ice blue colour, then drybrushing them with white paint, finally covering the base with the same white decoration sand used for the rest of the board. There’s a lot of terrain on this board. I wanted to give people the idea that this is a forgotten or abandoned resource facility of some sort, hence the big supply containers on the ice field on the left lower tile. I hope you like the board. It’s been made to accommadate my Chaos Space Marines army, which also all have snow bases. The only thing left to do is finishing the river, that I want to give it a frozen feel, but maybe just leaving it as water, with bits of moss on the bottom of it. Next up is Fulgrim, The Illuminator, The Phoenician, Liberator of Chemos, Primarch of the Emperor’s Children Legion. A few things about him: I just loved painting Fulgrim. The details are stunning, most of them really connecting to his Legion. From the wings on his boots and the one on his left shoulder to the small ornamental details on his armour. The model just looks amazing. The only thing I always somewhat disliked about this model is his facial expression. His mouth just looks like he’s ready to give Ferrus some serious head. I really wanted to fix that, but I was afraid that, by doing so, I would screw it up and ruin the head, So I just let it this way and painted it as best I could. The other thing I love about the model, which is pretty obvious, is that his base interlocks with Ferrus Manus’ base, showing the epic battle between two of the closest brothers amongst the primarchs during the Istvaan Massacre. I tried to paint him somewhat neutral, like I did with Horus, so he can be used both as the Loyal and the Traitor Fulgrim, though the fact the model is wielding the Laer blade already suggest he is already on his road to treachery. Hope you like him as much as I do. A while ago, I painted up the model of Ferrus Manus, the Gorgon, The Iron Hand, Slayer of the Great Silver Wyrm Asornith. What a detail!! he is packed with tiny little details referring to his legion like smal cogs and the Iron Hands emblem on his left shoulder, but also that backpack just looks awesome. And he jsut really appears strong in his pose. The little detail that I especially love is his hammer, Forgebreaker. The head of the hammer really gives away the fact that this weapon was made by his most beloved brother Primarch Fulgrim. All the small details and then that eagle on its but. Just great. And I really wanted to make clear why he is the Primarch of the iron hands, painting his hands in a metal colouring up just below his elbows, giving away his past of slaying the Great Silver Wyrm, Asornith, pushing it in a volcano with his bare hands and ultimately inheriting the same metal the Wyrm was covered with. All in all I had a lot of fun painting Ferrus Manus and I really like how he came out of it. How about you guys? I did Angron a while ago, but the pictures of the last post were not of very good quality, so here he is again, better quality pictures and more, to show every detail on him. After a 20 hour paint session I finished him. The one and only Horus Lupercal, The Warmaster of Mankind, The first found son, Primarch of the Sons of Horus/Luna Wolves and Arch-Traitor to the Imperium. Been having a lot of fun painting him. The details on Horus are breathtaking, the model itself looks like he could step from the statue any time. Being one of my favorite Primarchs of all time, I just couldn’t resist buying the model and painting him up to the best of my ability. And it was worth it. The result, I think, is just stunning. Never have I ever put down so much work and brought so much detail to life. I hope you like how he looks, because to me, he is ready to put the galaxy aflame! !